Two weeks after Uber’s $100 million settlement with 385,000 drivers in Massachusetts and California, the ride-hailing service is facing fresh litigation. On Sunday, a class-action lawsuit on behalf of hundreds of thousands of Uber drivers was filed with an Illinois district court—the scope of which is national. Much like the case settled in April, the newest suit alleges that Uber drivers are misclassified as independent contractors and should, as employees, be reimbursed for unpaid overtime and expenses accrued while driving. 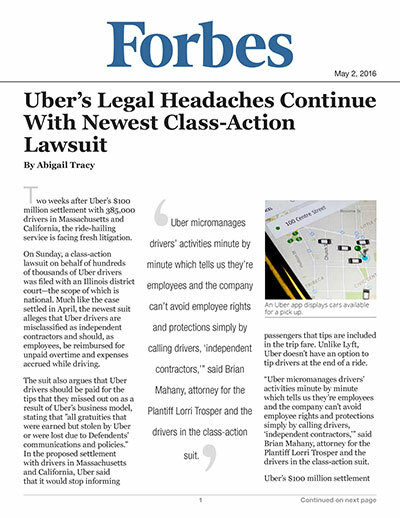 The suit also argues that Uber drivers should be paid for the tips that they missed out on as a result of Uber’s business model, stating that ”all gratuities that were earned but stolen by Uber or were lost due to Defendents’ communications and policies.” In the proposed settlement with drivers in Massachusetts and California, Uber said that it would stop informing passengers that tips are included in the trip fare. Unlike Lyft, Uber doesn’t have an option to tip drivers at the end of a ride. “Uber micromanages drivers’ activities minute by minute which tells us they’re employees and the company can’t avoid employee rights and protections simply by calling drivers, ‘independent contractors,’” said Brian Mahany, attorney for the Plantiff Lorri Trosper and the drivers in the class-action suit. Uber’s $100 million settlement last month marked a win for the ride hailing company, allowing it to dodge the real issue at the root of these lawsuits: its contractor model. Whether this newest lawsuit will reach a similar conclusion remains to be seen. “Nearly 90 percent of drivers say the main reason they use Uber is because they love being their own boss. As employees, drivers would have set shifts, earn a fixed hourly wage, and lose the ability to drive with other ridesharing apps—as well as the personal flexibility they most value,” an Uber spokesperson said in an email to FORBES.